The StarMessage screen saver is a relaxing screensaver that may be one of the most beautiful creations after the "BIG BANG". It displays a realistic presentation of the night sky, with the moon in its actual phase. 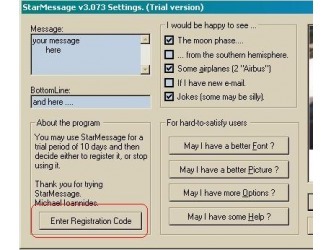 In addition, you can use the stars to leave a series of messages in the sky. And finally, you can send it as a gift to your friends. 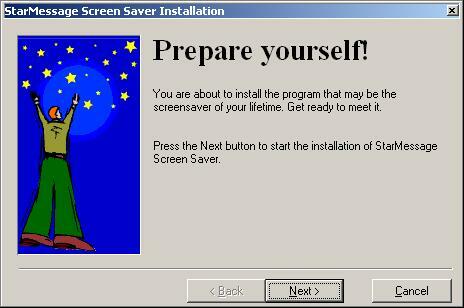 The screensaver runs in Microsoft Windows 8, Windows 8.1, Windows 7, Windows Vista, Windows Xp, Windows 2000, Windows ME, Windows NT,Windows 98, Windows 95. Runs flawlessly under 32bit or 64bit windows and 64bit Mac OS X.
Instantly see the current moon phase. A cold night or a cloudy sky will not stop you from seeing today's moon phase. 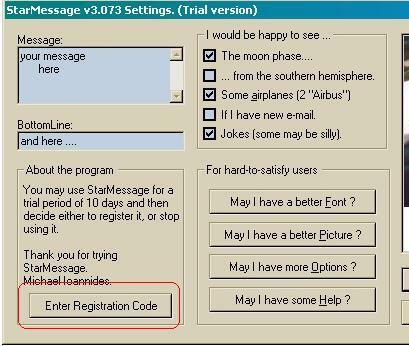 To view the lunar cycles with StarMessage, you won't need to connect to the internet or manually start a program. 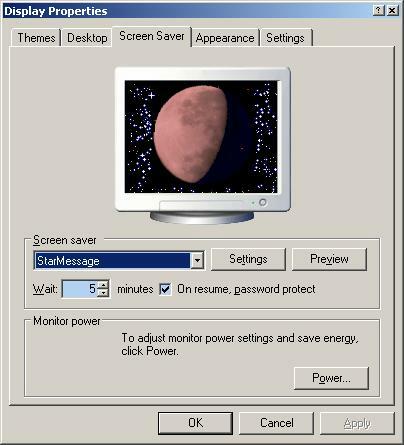 The screensaver automatically starts whenever you don't use your computer, shows you the lunar phases and notifies you about an upcoming full moon one day before. The screensaver also shows you the percent of illuminated moon surface as the phases change. Write your name in the stars of the night. 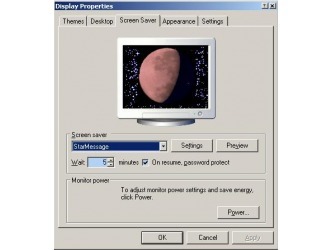 The screensaver moves the night sky stars to spell your name. Or you can write any other inspired message with the stars of the sky. If your loved-one uses your computer, you can leave each other love messages written the stars. A very tender way to express your loving feelings. Let the screensaver relax you with tender sounds of ocean waves, birds, lullabies and sleep reminders. The screensaver includes famous quotes about love, wisdom, peace and humor. Your own quotes can also be part of that list. You can send them to me, and if qualified, will be included in the screensaver and they will reach a wider audience. That's not all. You can find more features that you would like to use. On the hour cuckoo sound. Rooster for the morning hours. Flying pictures with flying messages. Count down timer for your important dates. Time in other locations of the world (world time). Ideal free promotional give-away gift for companies. Option to prevent the screensavers from starting by simply positioning the mouse on a corner of the screen. 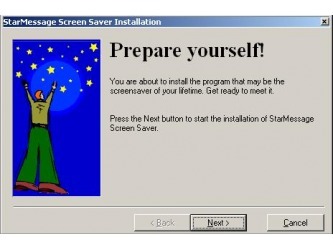 The screensaver is very easy to install or remove. 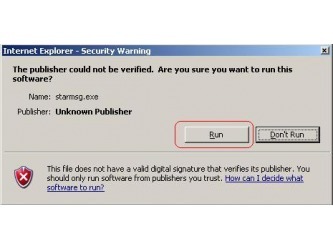 The program is harmless so you can safely play with its' parameters without worrying about your computer's stability. You can start playing with it by downloading now the free evaluation version. 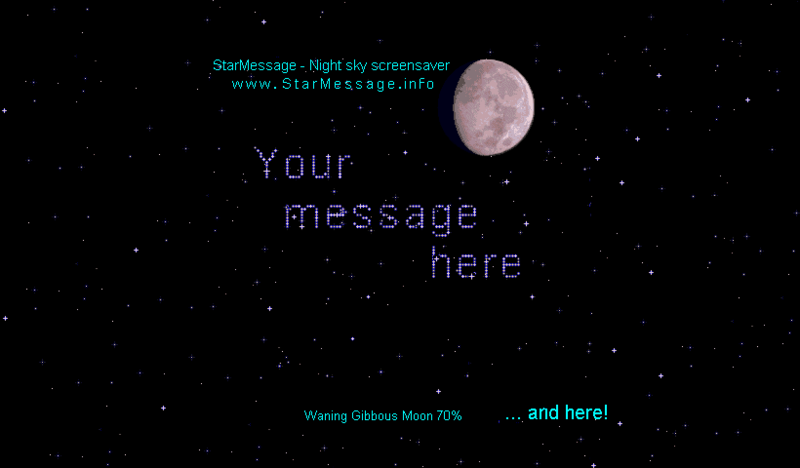 The StarMessage screensaver is used by people in love, astronomers, astrologers, and anyone inspired by the sky and the stars. You can have it as a daily moon phase reminder even if you have another moon phase calendar on your computer or on your wall. When I was younger, I used to stare at the night sky. Finally, I grew up and ended up gazing at computer screens. So, I created this screen saver to remind me that I should always aim higher. Test our free trial version of the screensaver. Easy installation and removal. I LOVE this screensaver! It is wonderful to sit back and watch the stars "fall into place"! Blessings and thank you. This is by far the very best screen savers one can find. Lost hard drives etc....I will reinstall each and every time. Have had since 98 and wouldn't change it for one second. Who can ask for more than the 'moon and stars'?